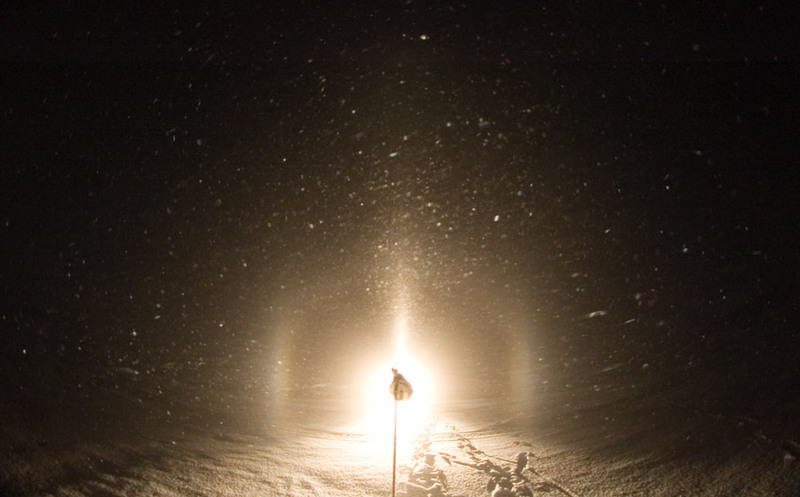 On 19th January the four of us, Jukka Ruoskanen, Marko Mikkilä, Ágnes Kiricsi and Marko Riikonen gathered at the Kilpisjärvi biological station in northern Finland to make halos. 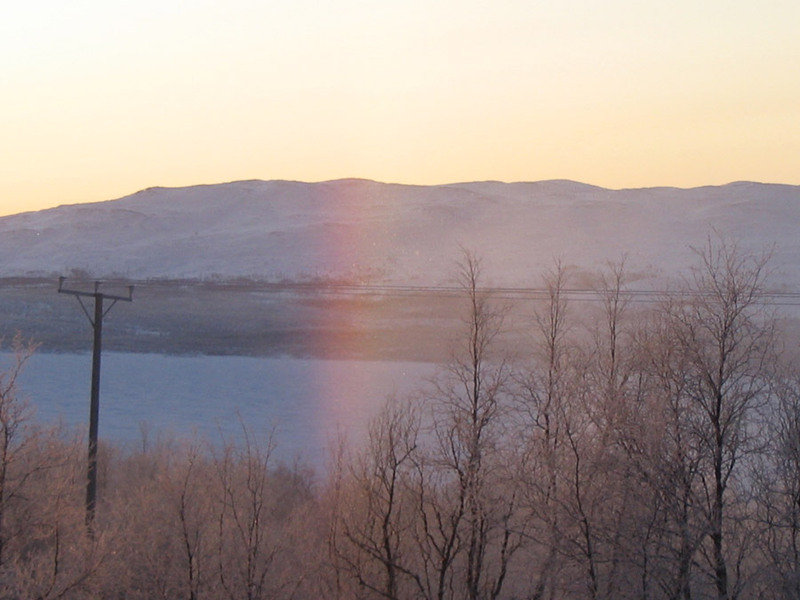 We had got some evidence that weather conditions in the Kilpisjärvi area might be favourable for ice crystal formation as long as the nuclei are provided. 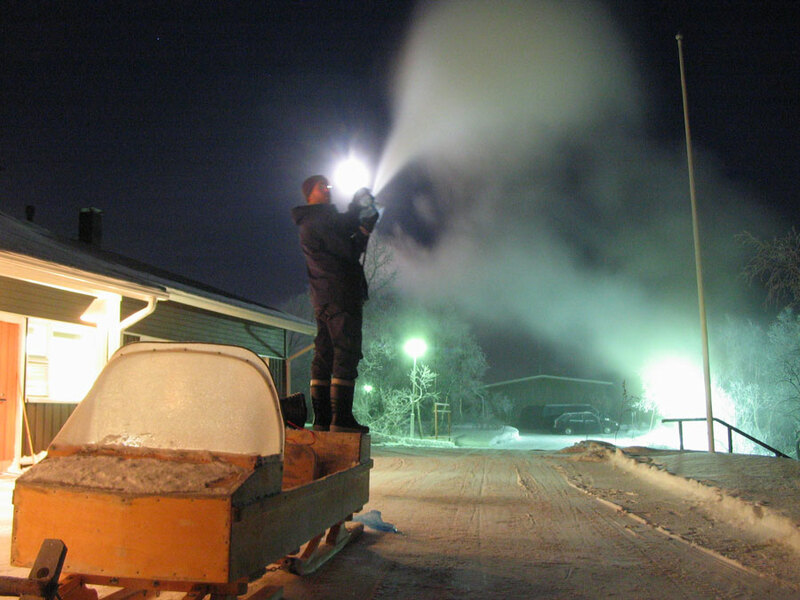 At his home, Marko Mikkilä had already done successful initial experiments of creating halos with a mixture of kaolin and water sprayed in the air, and this time we wanted to do more tests on the system. During our one-week stay, we were able to create displays on two days and three nights, the temperatures being around -20 °C. 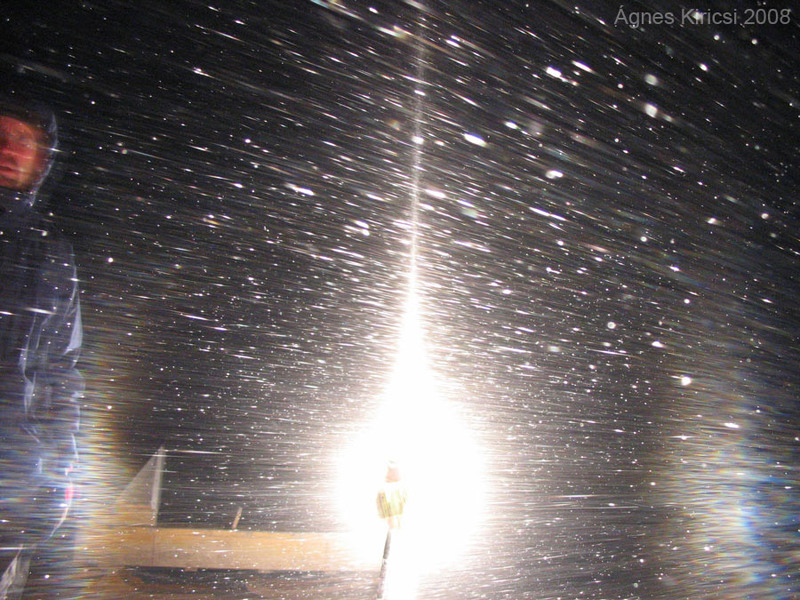 The diamond dust cloud that developed seemed to be kilometres wide. This was accomplished with only about 10 litres of water and two spoonfuls of kaolin. The crystal swarm usually lasted about half an hour and then it was time to go back to spray more ( 1 – 2 ). On one night we succeeded in making halos 12 hours continuously. 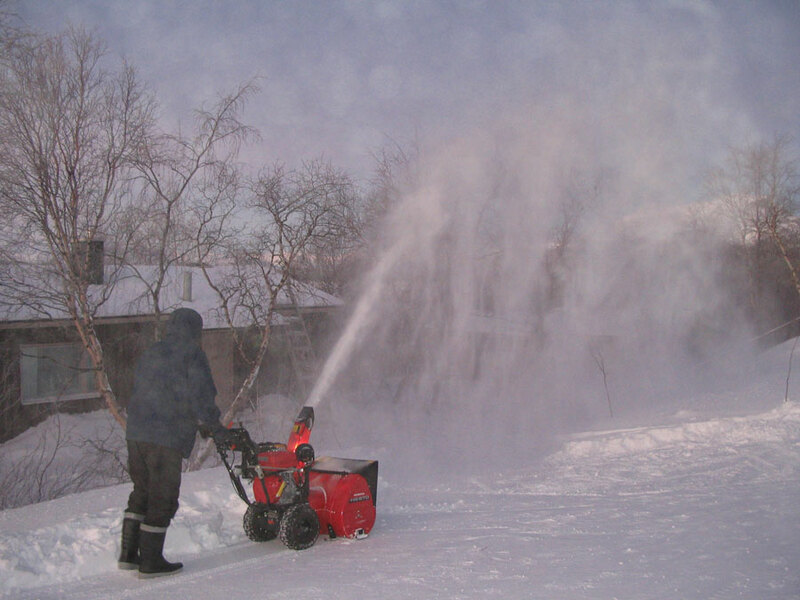 We also tested a snow blower. 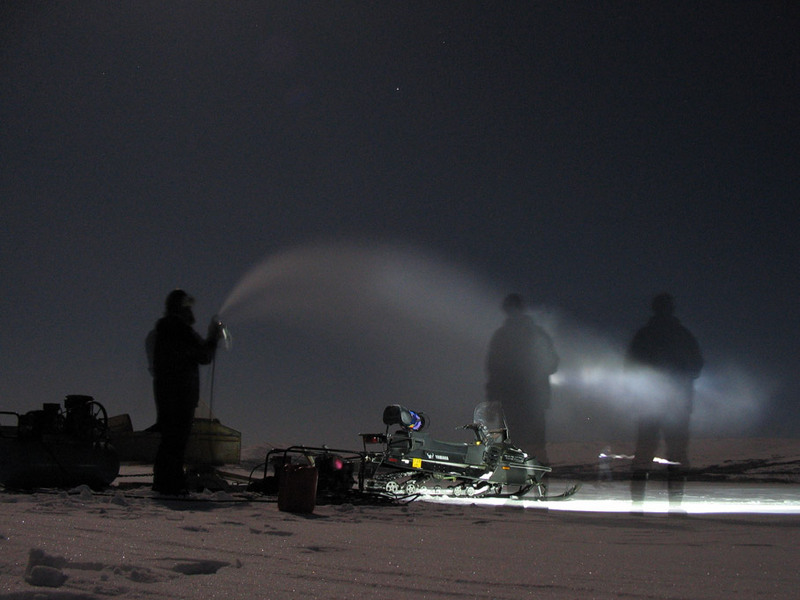 A good display had been observed ten years ago in Resolute Bay created by such a machine (see drawings in Sivuaurinko 3/98 on pages 9 and 10). Our impression was, however, that it was not nearly as good as kaolin, and we eventually quit using it. 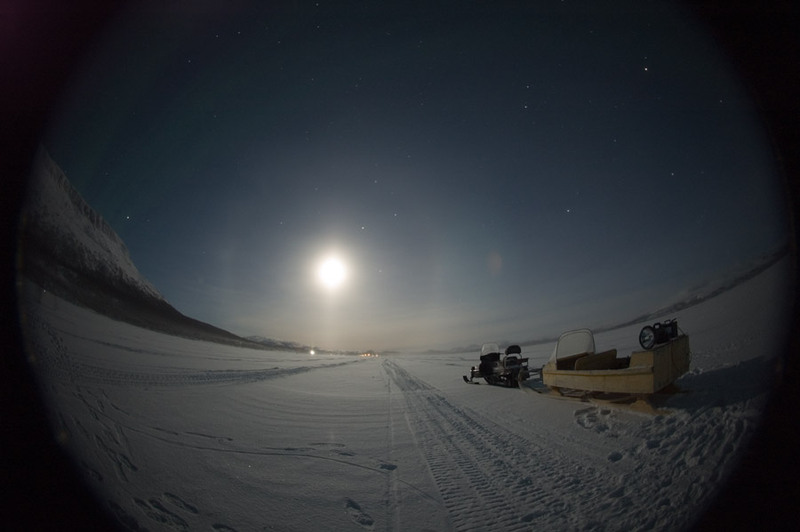 Mostly we had plate displays ( 1 - 2 ), but on two nights at the beginning of the favourable conditions there were also halos from column and Parry oriented crystals. Diffuse arcs and upper sunvex Parry arc were seen. Moilanen arc was present only on one night for a short while. We also tried spraying water mixed with montmorillonite (also known as bentonite) on one day and managed to create a weak plate display. This clay mineral is referred to be an even better nucleator than kaolin, but we found its use problematic because of its clumping habit. After each spraying round photographing the halos was sort of a hassle, there was not much time for fine tuning. The next step in halo making is to have a continuous automated feed of the nucleating mixture. Then the real fun can start. I hope we'd see some more images about this one week of cristals and lights! Excellent, thanks for the interesting and nice write-up. Still sorry that I couldn't come. I had really looked forward to this trip.